The committee praised the 27-nation EU for reconciling the continent after World War Two and for its role in spreading stability to former communist countries after the 1989 fall of the Berlin Wall. “In the inter-war years, the Norwegian Nobel Committee made several awards to persons who were seeking reconciliation between Germany and France. Since 1945, that reconciliation has become a reality," the Nobel Peace Prize Committee said in a statement. "Today war between Germany and France is unthinkable. This shows how, through well-aimed efforts and by building up mutual confidence, historical enemies can become close partners,” the statement went on. European Council President Herman Van Rompuy said that the Nobel accolade recognised the bloc's role as the "biggest peacemaker in history" while EU Commission chief José Manuel Barroso hailed it as "a great honour for the whole of the EU, all 500 million citizens." But the announcement also quickly drew spirited reactions from EU commentators and bloggers, who mused about who should go to pick up the prize in Oslo. "I’ve no idea who will go to get the prize – will it be Barroso, Van Rompuy, Schulz, Ashton, Reding, Fuele, Piebalgs, Georgieva or all of them," commented EURACTIV's senior editor Georgi Gotev on his blog Reuniting Europe. Jean Quatremer, the correspondent of French daily Libération, tweeted that "instead of boring Barroso and Van Rompuy", an ordinary EU citizen should go to Oslo to collect the prize. The five-person Nobel Peace Prize committee includes one bishop, a lawyer, and politicians such as the committee chair, Thorbjørn Jagland, a former Norwegian foreign minister and current secretary-general of the Council of Europe. Its announcement said that the integration of Greece, Spain and Portugal in the 1980's, the admission of Croatia as a full member in 2013, and the accession talks currently underway with Montenegro, Serbia and other Balkan countries all bore testimony to the bloc's role in promoting reconciliation. "The stabilising part played by the EU has helped to transform most of Europe from a continent of war to a continent of peace,” the statement said, referring to Alfred Nobel's vision of promoting "peace congresses". The Nobel Committee recognised the deep challenges now facing the EU as it struggles to emerge from a sovereign debt crisis that has forced public-funded bailouts for Greece, Ireland and Portugal, and which now threatens to engulf Spain. The EU is currently undergoing grave economic difficulties and considerable social unrest, according to the Nobel Committee. Their announcement expressed a wish to focus on "the EU's most important result: the successful struggle for peace and reconciliation and for democracy and human rights". The prize, worth one million euro, will be presented in Oslo on 10 December. The Nobel Peace Prize is one of the five Nobel Prizes bequeathed by the Swedish industrialist and inventor Alfred Nobel, along with the prizes in Chemistry, Physics, Physiology or Medicine, and Literature. It is awarded to those who have "done the most or the best work for fraternity between nations, for the abolition or reduction of standing armies and for the holding and promotion of peace congresses." Per Alfred Nobel's will, the recipient is selected by the Norwegian Nobel Committee, a 5-member committee appointed by the Parliament of Norway. Since 1990, the prize is awarded in Oslo City Hall on 10 December each year. See here the last Nobel peace prize laureates. Reuniting Europe: EU wins Nobel Peace Prize. Give the million to the EU public space! EURACTIV Turkey: Nobel Bar?? Ödülü'nü Avrupa Birli?i kazand? Is this a joke? I guess if they can give it to Obama, anything goes. Kissinger got it to, so there’s nothing unreal about this farce. Problem is Barosso will go up a step in his delusion of self importance, and may have to be committed to an asylum. A much needed and well deserved prize. It is quite sad to read that even some MEPs are making jokes about this important recognition. No wonder that European citizens are loosing faith in the project, if the very people sitting in the institution that should best represent them do not believe in it! Nobel Committee has adopted the controversial decision again. But simultaneously it urged us to consider what in fact the EU is? Is it a commonwealth of countries including those whose governments used to send troops to Yugoslavia and Libya? Then such a Union doesn’t deserve the Peace Prize. Or is it a half of billion people that proved their ability to live together in peace and freedom? Then it obviously deserves it. In this context I`m curious about who should collect the Prize on behalf of the EU? On John Worth’s blog I’ve just voted for Anonymous European. And my idea is to conduct pan-European electronic referendum or to adapt ECI mechanism to define the best way of spending EUR1 mln. 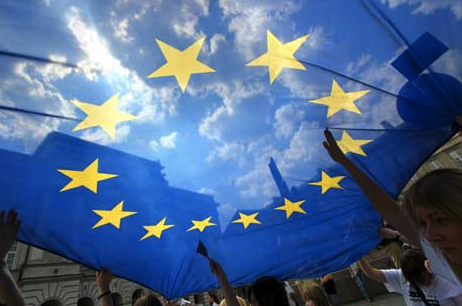 To Proud European, I am a great fan of the EU and have been praising it in my EU law classes for years. But there are many many brave individuals and groups who have risked their lives to try to bring/maintain peace in this nasty old world. Simply awarding it to a group of countries who have managed not to try to wipe each other out for 50 years just doesn’t cut the mustard. Why not give it to America for not attacking Canada – the list is endless if you go this route. Hopefully, the EU does not need this kind of hollow kudos. If they do, we are all in more trouble than we thought. @Bikey – I agree but I think at the stage we are now we should be concerned that the European project risks of going to dust. So I think the Nobel is an important reminder of what we could loose if we continue to allow our national governments to let the EU take the blame for the crisis, whilst our fellow European citizens are blind enough to let their governments go away with it. The interesting issue is that Norwegian population is deeply anti-EU. Is it deserved, well yes, of course, but it sents the wrong message to the governing elites of the project. I would be perfectly fine with a Nobel for Marietje Schaake. Or with a Nobel for the European Federalists, the civil society supporters of European unification in the tradition of Hertenstein. But the current EU elites have to change their modes of operations. Barroso simply does not tell the truth when he speaks about citizens, because the Commission under Barroso has no concept of a public interest, they serve the “stakeholders”, the Commission usually act against the public interest as we have seen with ACTA and many other projects and parliament across all fractions has to correct that and overcome the arrogance of the Barroso Commission. Congratulations to the EU! May I propose that the prize money is used to re-finance the Erasmus Programme, and Erasmus Mundus, as these have really contributed to integrating Europeans by encouraging students, young entrepreneurs and researchers to study in another country. The funding for all this is now running out, and the Nobel Prize would be put to very good use. The achievement of his Noble Prize, let us keep hugging it for ever…above all we keep showing one face to all mankind.